Even if you didn't win, please enjoy these sparkly balloons. Well it’s been just over a week so we should probably announce who won that contest we were running, eh? Sorry it’s taken a bit to announce. That kickstarter was awesome and we and incredibly appreciative of everyone’s support…but it was also exhausting. We had to recover a bit and also do a little coordination about the prizes. We added a bunch of games to the prize pile but never said exactly how we’d give them out. Here’s what we decided. In addition to the $150 grand prize and the $50 runner’s up prizes, we made 4 prize packs of games. These games are generously donated by our awesome project manager David McKenzie, of Game Salute and Clever Mojo Games. These are games from his personal stash (still shrink wrapped and new) so we are very grateful to him for helping us out with the contest. The winner now gets $150 AND 1 prize pack of his or her choice. There are now 6 runner’s up. We’ve got 3 $50 Game Salute credit prizes and 3 additional prize packs to hand out. In order, each runner up gets to choose between one of the $50 of game credit OR one of the prize packs. The later runner’s up may just get what they get. If you are one of the lucky winners, you need to contact us at: escapadegames@gmail.com. Let us know your name and address where we can send a prize pack. If you are a runner up, let us know your top 3 choices between $50 game credit or prize packs. Please be aware, if you do not have an address in the US we may not be able to send you a prize pack due to the increased costs of shipping packages of this size internationally. Thank you to everyone that participated. We very much appreciate your enthusiasm and support. We hope you’ll still keep checking up on us for more fun blog content and more updates about how things are going with Story Realms. (Though in the future, most updates about Story Realms will continue to be on the Escapade Games Blog). Ranko Miklin! Congratulations Ranko, contact us ASAP and let us know which prize pack you want and what address to send it too. Here are the runners up. 1 Amazing Community...and a Giveaway! We've got 24 hours left on our game giveaway and the Story Realms Kickstarter! Our community of friends and supporters has been so amazing that today's post is just one big thank you. If you haven't had a chance to check out the kickstarter (or the contest) check out these amazing comments from our fans. We're making some fantastic stretch goals, but we are still looking to recruit more backers to the Story Realms community. Also, check out the bottom of this post because we are updating the giveaway with even more games. And here's one last Game Salute game to consider getting with your prize money! Okay it's a bit cheesy but seriously, did you think we'd end on anything else? If you haven't backed the kickstarter or you want another copy as a present you COULD save your prize money until the game comes out or use it to pre-order it. If not...well we told you 27 other games you could spend your loot on. Thanks again for all of your efforts and support. We look forward to picking some winners here in the next few days. 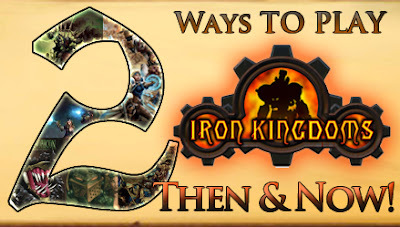 2 Ways to Play: The Iron Kingdoms RPG Then & Now... and a Giveaway! 2 days left of on our game giveaway to support the Story Realms Kickstarter. Today, we will be exploring a game that the entire Growing Up Gamers crew have played and loved: Iron Kingdoms. This dark fantasy role-playing game depicts a world ravaged by endless battle and devastating machines of war. It was one of our favorite games to play with D20 System and now a new version is out that much more resembles the mechanics of the Warmachine system. No one here is more qualified to talk about Iron Kingdoms than Randy, who ran the games we played and has spent countless hours reading about the Iron Kingdoms and painting many miniatures of the games heroes and villains. When I first saw the Monsternomicon, Volume One on the shelf at the local game store, I knew I had to have that book. It was 2002, when Dungeons & Dragons third edition was still fresh and new. I cracked open the book and had my first glimpse of a neat, new world... one that took a step back from the standard fantasy tropes, threw in an industrial revolution that was half steam powered, and half fueled by arcane magic. Welcome to the Iron Kingdoms. The narrative of the settings is that it is a world at war in many ways. There is the struggle between the nations of the world, as some seek to expand and others try to protect their borders, and their allies. There is a struggle between the forces of progress, and those who would stamp out the smoke-belching factories. Religious zealots, too. These conflicts offers ample plot hooks for all manner of stories you might want to tell and participate in. The D20 version of the Iron Kingdoms was introduced in a series of modules called The Witchfire Trilogy. 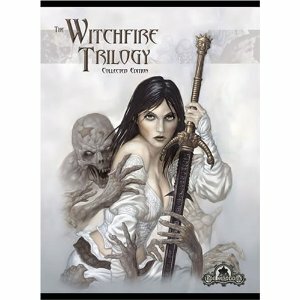 The story introduced us to the complex antagonist Alexia Ciannor, and the unholy blade she came to possess, the Witchfire. The Monsternomicon that I mentioned before followed, then a short volume called Lock & Load. After that, it was a long wait for the Iron Kingdoms Character Guide and the World Guide, but the wait was well worth it. Those books are, in my opinion, some of the most well-written RPG books ever to grace my shelves. One of the most memorable campaigns I ever ran was set there. It is really a pity that the publisher, Privateer Press, was far more focused on its wargames set in the same world, although to be fair, the books supporting those offered great source material. 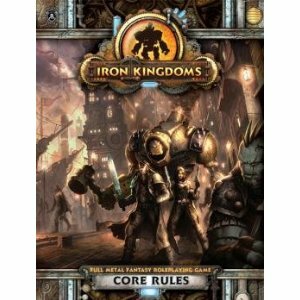 A month ago, my wonderful wife brought me a copy of the new Iron Kingdoms Core Rules home from GenCon. I have been waiting for quite a while on this one, and it is a beautiful book. Full color, loads of art... and a new system. The system is based on the rules of the wargames Warmachine and Hordes, and is even compatible somewhat with them. It marries the character advancement options of previous RPGs with the "wargamey" rules of a tabletop miniatures game. And the execution is good. I admit to being very sceptical the first time I heard about it. I honestly love miniatures, and have a great time painting them. I use them in other roleplaying games, too, but I wasn't sure that I wanted to be nudged toward being a Warmachine player. I recently just played a battle scene pitting units from Warmachine against characters built from the Core Rules, and I had a great time. It was indeed very much like a wargame, and it certainly shone. We played a combat that would have been insanely complex in the D20 system in a pretty short amount of time; that's a plus. I still have yet to try a more traditional RPG adventure, though I suspect the system's relative simplicity will allow that to run smoothly, too. So... which is best? Time will tell. The D20 system is very familiar to most roleplayers and lots of sources exist to supplement player options. The new system, with its compatibility with Warmachine/Hordes, allows you to play epic battles in less than half the time of a comparable on in D20. Right now, I like them both. I have already played one combat scene with the new system and was quite impressed. Happy gaming! Today we are showing off 2 more Game Salute games you can spend that prize money on. Today we give you 2 games with very unique themes. 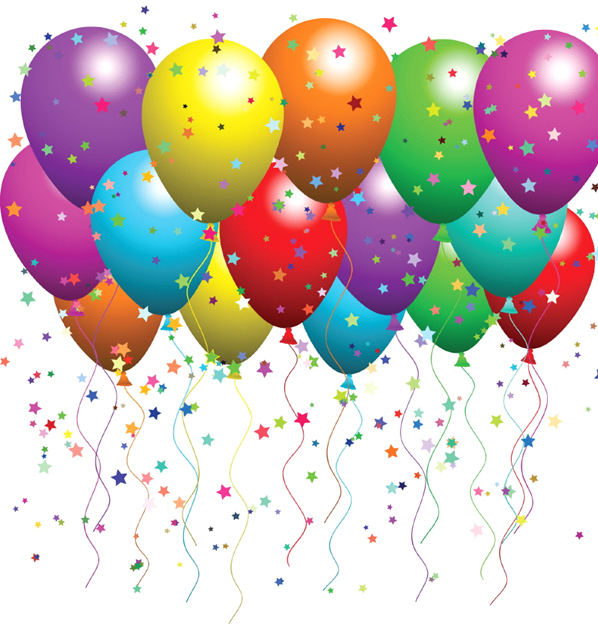 Also, we hit 600 backers today! We will definitely be adding some games to the prize mix. Keep spreading the word and check back in tomorrow to learn about what loot is going to get added in these final days of the giveaway. 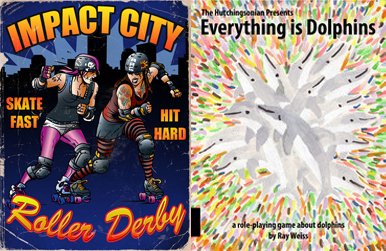 Seriously, how many games have you heard about that are based on the Roller Derby? In this fast paced board game you try to get Jammer to pass more opposing players than your opponent's Jammer. You must use strategic movement to pass or block your opponent. Dice rolls and special cards are used to execute different offensive or defensive plays straight from the flat track derby race. You can even get dirty and play foul cards which allow you to risk getting caught by the ref as you cheat your way to the win. Speaking of unique, this is a pen and paper role-playing game entirely about dolphins set in a world where there are no humans. It's also an art book. The art is bizarre and beautiful. It comes from a variety of high and low and elsewhere artists. The game play hovers somewhere between side scroller video game (though it is not a video game), talking animal fairy tale, and triptastic fun. The art is bizarre and beautiful. 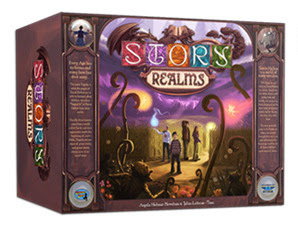 Three days left as our countdown to the end of the Story Realms Kickstarter continues along with our games giveaway! Today’s topic, fun games that might actually teach you something. Now I’m sure you’ve seen educational games before. 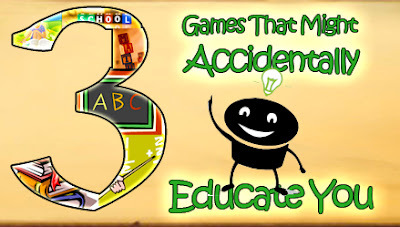 These are games where the primary reason for their creation is to help explain a concept or introduce subject matter to students hopefully in a way that is more entertaining than a lecture. Of course, the primary goal is education, not fun, so these games often aren’t exciting enough to convince students to play with them much outside of class. What you may not know is that almost all games, even those designed primarily for fun, have educational value. These three games are ones the Growing Up Gamers crew have played and enjoyed many times. We play them because they’re fun. It’s that simple. However, as we’ve thought about them more we’ve come to realize that playing them is doing more than providing us with a great time. It’s teaching us something, too. 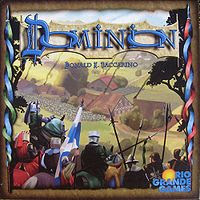 For those unfamiliar with this incredibly popular game, Dominion is a deck-building game. Players start with their own deck of the same 10 cards. Over the course of play, they “buy” different cards from communal stacks in order to make their deck more powerful so they can acquire the highest point cards and win the game. Dominion teaches a lot about probability, balancing resources, and the value of quality over quantity. If you buy more of the same card, it increases the chances that card will come up when you need it and make your strategy more reliable. If you buy a variety of cards, you may have more options, but you might not be sure of what you can do from turn to turn. Once of the best strategies in Dominion involves “trashing” less useful cards out of your deck so they are gone for good. You can buy gold (the best money card) and just add it to your deck. However, when you really start to “get” Dominion is when you realize that trashing out your starting copper (effectively ridding your deck of some of its money cards) is incredibly helpful because it means you’re more likely to draw into your gold. Playing Dominion is mostly about enjoying the fun of gaining cool new cards and watching them work. However, as you play and improve you are also learning how to keep different resources in balance and the value of refining down to a smaller selection of superior resources instead of a larger selection of less useful ones. 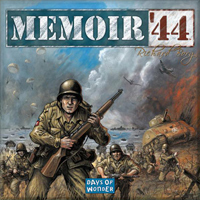 Memoir '44 is a brilliant tactical boardgame that puts players in command of armies in World War II. Most games of this type go for an exhaustive simulationist experience, but the simplicity of the system this game uses allows scenarios to play around an hour. The scenarios are based on actual battles of the war and each starts with a brief synopsis of the historical context the battle is happening in. It's hard not to walk away from this game without having learned something, and, if you plan on playing through the scenarios in order it should give a pretty good understanding of how the European theater of the war played out, starting with D-Day. Beyond the base set, it introduces different theaters (like the Pacific), different armies (such as the Russians) and rules that push the theme and the political realities (like the Commissar rules for the Russian army). Agricola is a worker placement game about subsistence farming. Each turn the game reveals new kinds of actions for the players to consider and the players take turns placing workers, gathering resources, and trying to build the best farm possible. Every so often, you have to use resources to feed your family or face dire consequences. There is a huge variety of different cards that can change the starting set up for each player and this variety keeps Agricola fun for many repeated plays. Agricola has a lot to teach about managing complex systems, planning ahead, and anticipating the actions of others. However, game systems and theory aren’t everything. Where Agricola really succeeds is in teaching the player something about its theme: subsistence farming. There is precious little time to accomplish everything you want to do, and the times you have to feed your family weigh heavily on your considerations of where to spend your resources. To get crops or raise livestock takes investment and time. You have to plant and then the crops will produce…for awhile. Then you must plant again. The day to day, year to year (and turn to turn in the game) struggle of staying ahead drives home the immense difficulties involved in subsistence farming. 3 Game Salute Games to Brighten Up Your Day! You play as one of the great monarchs from 17th and early 18th century Europe representing one of the seven top powers of the era: Austria, England, France, Poland, Russia, Spain or Sweden. Your objective is to be recognized as the most prestigious monarch by producing the most admired art and culture, lead the continent in scientific innovations, spread or resist the spread of Catholicism, and attempt military expansion beyond your historical borders. All of this is accomplished by marshaling 134 historical "luminaries": important historical figures covering every relevant domain of human achievement during the period. The luminaries are rated in between one and seven different areas of endeavor: military, politics, religion, ideas, science, art or wealth. Additionally, each luminary has a unique Action, Enhancement or Response based on their real historical achievements to be brought to bear in service of your nation. Exile Sun combines some of the most compelling strategic mechanics in a way that delivers a streamlined, integrated and fast paced game of competition and conflict. 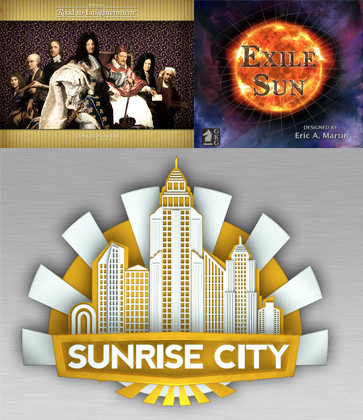 Simplified deck building, hand management, simultaneous hidden worker placement, a card draft, 6 unique player advantages, and a revolutionary zero-luck combat resolution system ensure that playing Exile Sun is like no other game. Private and public card-based objectives give players options for points, but they must choose carefully when allocating their limited resources. The player with the most points accumulated at the end of three game cycles wins. In the tile-laying game Sunrise City, players build a city with zone tiles, bid for control of those zones, then place building tiles on the city zones to their best advantage. Each round the players use role cards to grant them special abilities in the various game phases. Points earned during play move score tokens up a ten point track. Players score one benchmark token if their score marker overshoots the star at the top of their score track but earn two benchmarks if their token lands on the star by exact count. Thus, Sunrise City is not a race to score the most points; it's a contest to grow the city in a manner that will earn you the right number of points at the right time to maximize your benchmarks. After three rounds, the player with the most benchmarks wins.